AKC Judge for all Sporting and Non-Sporting Breeds. A Tribute To Richard Beauchamp. Rick passed away April 5th 2014. Those who knew him loved him and those who didn't were denied opportunity to learn. Rick had cancer and the day he was scheduled to judge at Westminster, he had an episode so serious that he had to be hospitalized in New York City. He was watched over by close friends until he recovered enough to fly back to California on his own, declining Marjorie Martorella's offer to fly with him. He was cared for at his home by Florence Males. The news of his passing came as a shock. Lt. Col. Wallace H. Pede had just called him the preceding week. They talked about a new show venue and Wally said Rick was in good spirits and "sounded good". Rick Beauchamp was a dog man through and through. He was a gentle man. He was publisher of Kennel Review (the first and most prestigious dog magazine of its time) before he began judging. He championed several breeds, moving them forward into AKC recognition. Known as the father of the Bichon, he and I also worked together to get the Miniature Bull Terrier AKC recognized. A decade later he called me to help with getting the Toy Fox Terrier into AKC. His Tournament Of Champions at Cobo Hall was spectacular and innovative. Flower arrangements and dinner decor by Frank Sabella says it all. The dinner speakers were the Who's Who in dogs. In many ways, the Tournament was more glamorous, and more selective of the best dogs in the nation than any other event before or since. Rick knew everyone worth knowing and he was loved by all who knew him. 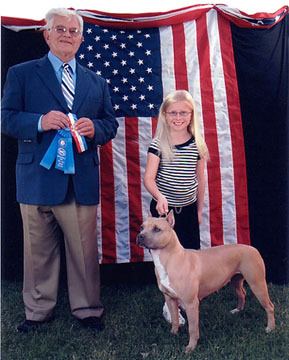 Meet Richard "Rick" Beauchamp, AKC Judge for all Sporting and Non-Sporting Breeds. He's a Cocker, Boxer, and Bichon Authority! August 2006 - Mr. Richard "Rick" G. Beauchamp has been successfully involved in practically every facet of purebred dogs: breeding, exhibiting, professional handling, publishing, writing and judging. He has lectured on dogs extensively throughout the world and is a published author of numerous breed and all breed books. After moving to California in l962 Rick purchased the local Southern California magazine, Kennel Review and developed it into one of the leading breeder--exhibitor magazines of the entire dog world. For over 30 years, Kennel Review served as the standard of excellence in its field until publication was ceased upon his retirement in early 1993. Rick’s monthly columns have been published in many magazines throughout the dog world including Dogs In Review and Bloodlines in the United States, England’s Dog World, Dogs In Canada, Oz Dog in Australia and All About Dogs in South Africa. His books Solving the Mysteries of Breed Type and Dog Breeding for Dummies are enjoying great critical success world-wide as are his many single breed books. Rick also lectures frequently on both dog breeding and dog judging. As a breeder-exhibitor himself he has been actively involved with and has campaigned breeds in all seven Variety Groups with a special interest in Irish Setters, Salukis, Anatolian Shepherds, Cairn Terriers, Toy Fox Terriers and Pembroke Welsh Corgis. Through the years Rick has bred champion Toy and Miniature Poodles, American Cocker Spaniels, Dachshunds, Cavalier King Charles Spaniels, Papillon, Bull Terriers, and Wire Fox Terriers. Group and all breed Best In Show winning Boxers and Doberman Pinschers also carry his Beau Monde prefix. 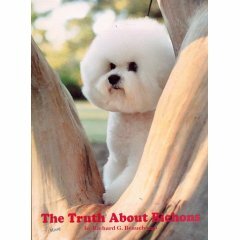 Rick is particularly associated with the Bichon Frise in which he specialized from the earliest days of the breed. He was owner of Ch. Chaminade Mr. Beau Monde, the breed’s Top Producing Sire of All Time (65 champions) and breeder of the Top Producing Dam of all Time (17 champions) Ch. Beau Monde The Fire Cracker. Beau Monde has bred nearly 100 AKC champion Bichons and the Beau Monde Bichons stand behind many of the winning lines around the world. Rick has judged extensively throughout the world. His major assignments include many appointments throughout the United Kingdom including Crufts, Leeds, Southern Counties, Scottish Kennel Club, and the St. Patrick’s Day Show in Dublin, Ireland. Rick has judged championship events many times in Canada, Australia, Scandinavia, Mexico, Europe, New Zealand, the Orient, Central America, South America and South Africa. He feels this international exposure to the great dogs of the world has provided him with a background and basis of comparison that few people are afforded and uses this experience in his frequent assignments throughout the United States. Highlights of his judging assignments “at home include the prestigious Del Valle Dog Club of Livermore International Kennel Club of Chicago and Westminster Kennel Club.